Barcelona, capital of Catalonia, home to some of the most fascinating pieces of architecure in the world. With its Gothic heart of winding medieval streets in the Old Town to the straight avenues of Eixample and the hill of Montjuïc, Barcelona nestles on the coastal plain looking out into the Mediterranean Sea. Towards the end of the nineteenth century a variant of the art movement Art Nouveau, Modernisme, was born in Barcelona. The movement's most well-known exponent was Antoni Gaudí and Barcelona is brimming with his work. The Eixample district is full of modernist buildings created for wealthy clients that became synonymous with Catalan Nationalism. Perhaps the most well-known of Gaudí's works is the as yet unfinished church, the Temple Expiatori de la Sagrada Família. The church is full of symbolism and hours, days even, could be spent admiring the sculptures on the exterior of the church alone. Gaudí is buried in the crypt having spent the last 16 years of his life working solely on this creative masterpiece. At the top of the city, and offering some spectacular views, is the park designed by Gaudí for Count Güell. Originally intended to be a garden city, little of the design of public buildings and 60 houses was built. Opened in 1922 the park has, amongst other things, the cavernous covered market hall with crooked pillars and the Gran Plaça Circula with colourful mosaic contours and bench. An apartment block on the corner of Passeig de Gràcia this is one of Gaudí's final works before he focused solely on the Sagrada Familia. The building does not have a single straight wall and the white, wave-like walls are topped with intricate ironwork balconies. The building incorporated the city's first underground car-park. 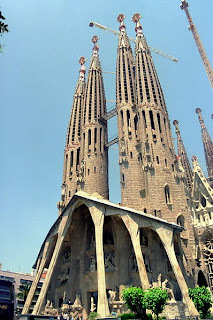 The chimneys and air ducts are sculpted as witch-scarers, espantabruixes. The building is now a culture centre offering tours and activities. 1 March to 4 November: 9am to 8pm (last admission: 7.30pm). The cathedral of Barcelona is a complete church but it took over 600 years for the finish touch, the central spire, to be added. Built over a Roman temple and mosque it is a mixture of Romanesque and Gothic architecture. In the crypt is the sarcophagus of St. Eulàlia who was martyred for her beliefs by the Romans. This is a very attractive church to be found in the Old Town district of the city. A large park with boating lake and orange groves it was previously the site of a citadel. The fortress was pulled down in 1878 but museums can be found in the old arsenal whilst a school is housed in the old Governor's House and the chapel remains as such. A wonderful place to have a picnic lunch before visiting the museums. The City Museum is housed in the Casa Clariana-Padellàs, a Gothic building which was moved, stone by stone in 1931 from the Carrer dels Mercaders to its current position. When excavating the site remains were found of the Roman water system which can be visited in the basement of the museum - to my mind absolutely the best part of the museum, a fantastic display. The website is only available in Catalan or Spanish. The best way to get to know a place is to wander through it, taking in the atmosphere. Barcelona has three districts that attract the tourists - Eixample, Montjuïc and the Old Town. Within those districts are areas which offer diverse and intersting takes on the city. A trip to Barcelona would not be complete without a stroll along its most famous avenue. Lined with trees the avenue is always busy with newstands, musicians and different stalls. At the harbour end is a statue of Colombus but along its length there are plenty of places to see - Palau Güell, Mercad de Sant Josep (also known as La Boqueria, a wonderful food market) and the Gran Teatre del Liceu amongst others. This is the heart of Barcelona, where the Romans settled and which has been the administrative location ever since. The cathedral, many museums and medieval palaces can be found in this part of the Old Town. Colombus was welcomed on his return from the New World here by the Spanish Catholic Kings, Ferdinand and Isabel. Montjuïc offers a brilliant vantage point from which to view the city. It is home to the castle, the National Art Museum and Poble Espanyol - a village containing replicas of buildings from the different regions of Spain. On a quiet medieval sidestreet alongside the cathedral this boutique hotel is a romantic spot with gothic arches and staircase and rich colours. On the roof is a leafy terrace deckedand the ground-floor bar has tables outside in the tiny Plaça de Sant Felip Neri behind the hotel. Charming but modern, the rooms are not fussy but the art nouveau features of the building remain. There are only 19 rooms in this small hotel but each is stylish. There are also self-contained apartments that can house up to 6 people. You can't ask for more from a hostel. This is modern with a fully equipped kitchen area, free Wi-fi, board games and a lounge area. There are a choice of dorms, which can also be rented for private use. pppn from €16 for a bed in a mixed dorm to €46 for a private room with single bed. Combining a cocktail bar, bookshop and library this is an ideal place for lovers of literature (the name translates from Catalan as just that) to imbibe. Books are available in Spanish, Catalan, French and English. A tapas bar Basque style with generous portions of meat, fish or cheese pinned to the bread with a pintxo. Keep hold of the sticks as they are how your bill is calculated. Local beers, wines and ciders are available. This is top of the range dining with a taster menu coming in at €125. The chef does have a Michelin star and gives Catalan cooking a modern twist but he also knows how to bring out the natural flavours of the food. Barcelona is served by Barcelona-El Prat Airport, about 17 km (11 mi) from the centre of Barcelona. Airlines that fly into El Prat include British Airways, Iberia, Easyjet, KLM and Air Europa. From the airport the city centre can be reached via train, bus, taxi or hire car. Trains are now a viable option for getting to Barcelona with high-speed lines opening across Spain and Europe. London to Barcelona-Sants can be achieved in 12 hours, Paris to Barcelona-Sants in about 9 hours. Like many Spanish cities Barcelona has a comprehensive public transport system with buses, trams and metro alongside taxis and bike hire. Funiculars are a good way to get to the top of some of the hills such as Montjuic and Tibidabo Hills. There is a very useful website to help find bus and metro routes around the city http://www.tmb.cat/en/home with a 'Going to/Where am I?' section.